The military has been involved before in putting up a barrier along the U.S.-Mexican border without explicit authorization from Congress, according to a 2009 government report. 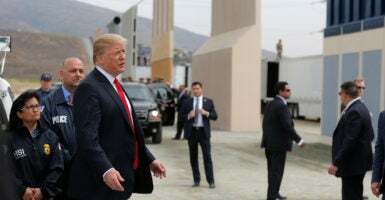 President Donald Trump recently proposed to draw from the $700 billion appropriated for the military for funds to build the border wall, which comes with a price tag estimated at $25 billion. Initial fencing constructed after Congress passed the 2006 Secure Fence Act was paid for by the Department of Homeland Security, while engineering and labor was carried out through an agreement with the Defense Department. It isn’t clear whether this is what Trump had in mind. The precedent means that military involvement would not be unheard of, said Art Arthur, resident fellow for law and policy at the Center for Immigration Studies, an immigration policy think tank. “The military can’t enforce immigration laws inside the United States, but it can help fortify the border as a national defense issue,” Arthur, the former general counsel at the Immigration and Naturalization Service (now Immigration and Customs Enforcement) told The Daily Signal. Entering a church service Easter Sunday, the president talked to reporters about problems at the southern border. Trump recently signed an omnibus spending bill that allocated $1.6 billion for 33 miles of border fencing. Days later, the president suggested in a tweet that money from the defense budget could be used for the wall since its construction is a matter of national security. Keeping drugs, weapons and contraband, and criminals out of the country likely could be classified as an act of national defense, Arthur said. 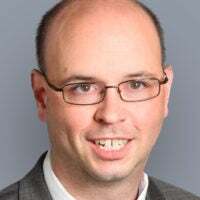 But diverting funds from the defense budget to the wall would be “incredibly unwise,” David Inserra, a policy analyst specializing in homeland security and immigration policy for The Heritage Foundation, told The Daily Signal. The U.S. can and should pursue improvements to border security and immigration enforcement through the normal budget process and also make additional policy changes that do not require significantly more funding, but handle enforcement more efficiently. This fixation on the border also misses the more important enforcement improvement that needs to be made to deter illegal immigrants caught at the border, or who overstayed a legal visa. Trump reportedly talked to Defense Secretary James Mattis about using defense dollars to pay for building the wall. The Pentagon has not characterized the retired Marine general’s reaction. The question is whether drawing on the defense funds requires an act of Congress. Opponents of the president, such as Rep. Pramila Jayapal, D-Wash., insist it does. Others, such as Sen. Mike Lee, R-Utah, a constitutional conservative and frequent critic of executive overreach, are cautious about weighing in. “We would have to see the specific statutory authority they claimed justified it,” Lee spokesman Conn Carroll told The Daily Signal. Trump did not specify how he would use Pentagon money for the wall construction, since enforcing immigration law is the responsibility of the Department of Homeland Security. But the two departments previously worked together, according to the report by the Congressional Research Service during President Barack Obama’s first year in office. Essentially, Customs and Border Protection provided money and land, while divisions of the Defense Department provided design and labor. The report states that Customs and Border Protection entered into a memorandum of agreement with the Engineering and Construction Support Office of the U.S. Army Corps of Engineers. The ECSO [Engineering and Construction Support Office] manages several components of the construction process for CBP [Customs and Border Protection], including planning and acquisition of real estate; drafting the environmental protection plan; designing the project and formulating the engineering costs; overseeing the construction process; and enforcing the appropriate warranties. On most of the tactical infrastructure projects, National Guard units and military units from the Department of Defense (DOD) Joint Task Force North provide the labor. DOD uses these projects as part of their training regimen, leveraging their ability to deploy tactical infrastructure and thereby providing zero labor costs to CBP. The agreement saved taxpayer dollars, as Homeland Security did not have to procure commercial contractors and provided training to military personnel on building barriers in combat zones. However, in its fiscal year 2007 budget request, Customs and Border Protection request the use of private contractor to expedite completion of portions of the border fencing. Under the agreement, Customs and Border Protection bought materials and acquired the land, and the Army Corps of Engineers did engineering studies and provided manpower and machinery used to install the fencing. “The actual manpower is typically provided by the State National Guard (the California National Guard, for example, constructed much of the San Diego fence), although occasionally the military, and sometimes the USBP [Border Patrol], are involved in the construction,” the Congressional Research Service report says. The Congressional Research Service is a nonpartisan research and investigative office on Capitol Hill that responds to requests from members of Congress. Asked March 27 about the potential for military funding for the wall, White House press secretary Sarah Huckabee Sanders declined to provide details. There isn’t enough information available to determine whether using military money to build a wall—absent congressional authorization—would be constitutional, said Hans von Spakovsky, senior legal fellow at The Heritage Foundation. “It would depend entirely on which pot of money at DOD the president wants to use, and what the rules are regarding that money as laid out in the appropriations bill that provided the money,” von Spakovsky told The Daily Signal. Building a wall along the southern border is likely beyond the capacity of the Army Corps of Engineers, said Arthur, the fellow at the Center for Immigration Studies. The U.S. has built some physical barrier along about one-third of the 1,933-mile border. This report has been updated to include Inserra’s remarks.